Located in the beautiful Caribbean, Virgin Gorda is one of the largest (the third to be precise) islands among The British Virgin Islands (BVI). From a distance, it looks like a plus sized woman lying on her sides and this attribute is what led Christopher Columbus to call it the “Fat Lady”. The Virgin Gorda is eight square miles of pure splendour and magnificence. If you are looking for an adventurous gateway with a lot of potential for both fun and relaxation, then this is your chance. 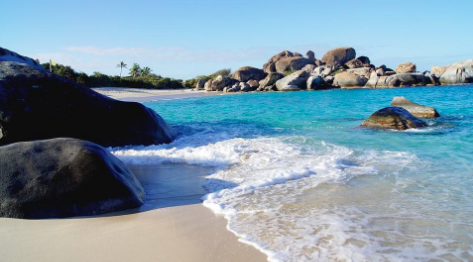 Here are the 9 best things you must do on your Virgin Gorda Vacations. Book your tickets, pack your bags, and set out for the azure Caribbean Skies. Traversing the grottoes of the BVI archipelago is perhaps one of the most satisfying experiences of the in the world. The granite boulder formations on the coastline are something to be admired up-close. The caves can only be accessed during the low tides and have historically been a place of foraging for food. Access is time restricted, that is, from dusk till dawn and the tickets are priced at $16 for adults and $12 for kids under the age of 16. Remember to bring your snorkels because the shallow waters provide a lovely and light underwater experience. After you’ve seen the Rhone National Marine Park, you will never use the expression “what a shipwreck!” the same way ever again. On the 19th of October, this vessel took its last breath after being hit by a deadly hurricane and the surrounding area, including the ship, had been turned into a Marine Park / Museum. From the surface, you can identify the ship’s bow but you have to dive below to explore this salty treat. After diving around 80ft, you can see the large vessel which is pretty much intact and get a chance at swimming with its current inhabitants like the octopuses and eels. No, Brewers Bay is not an actual brewery. Although this place can put you in a lazy daze as this is one of the least crowded beaches on the island. Sit by the beach and enjoy the lovely food at the seaside shacks and cafes. Sit down and contemplate or maybe even finish the bool you started reading. If you feel energetic after resting for a few hours, the crystal-clear waters are perfect for snorkelling. In fact, travellers agree that this is one of the better places for snorkelling as the waters are just perfect for observing colourful fish and marine life in general. It is advised that you bring your own gear as the ones on rent aren’t up to the mark as far as quality is concerned. Cane garden bay is the heart of all activity in the entire British Virgin Islands. Run to the sea and just jump in. You can even rent a Kayak to explore the western side of the beach. After you are done having your adventures, head to the shore and give yourself up to the marvel that is seafood. After sundown the walk into any pub (preferably one with happy hours) and enjoy the live music scene get drunk. The highest place in the Island of Virgin Gorda is the Gorda peak which stands tall at 1500ft. Gorda Peak National Park is, ironically, the home of the smallest gecko in the world. The trails are not intense at all and a lot of them lead to lookout towers on the peak and panoramic views are aplenty. It is also an amazing place for a romantic picnic. So, bring along that special someone with you. Formerly, the driving force behind the Island’s economy is now a National Park. When the settlers landed on the BVI, they started mining for copper and it saw its glory days in the 1800s. It also used to be the home of around 130 Cornish families that were labourers in the mine. Scattered around on the slopes you can see the ruins of houses, engine room, mine shafts and chimneys. It is almost like travelling back and time. Each of these elements has a story to tell. The thrill of the wind will sweep you off your feet as you soar among the clouds. Look down on the BVI through God’s eyes and experience the wonders of life. Parasailing is definitely a worthwhile achievement but it doesn’t get any better than the Leverich Bay Watersports experience. They probably one of the best around the globe when it comes to para-sailing. Let their experienced hands guide you through the process and make it safe and still worth your time. If you are looking to enjoy a bit of seclusion then why not look at birds at the same time. Carry a binocular when you head Long Bay because you wouldn’t want to miss out on the brown boobies (yes that is a species of birds, believe it or not). Long Bay is also home to spotted sandpipers, ruddy turnstones, blue herons, black-necked stilts and pelicans. Apart from the occasional sailboats anchored, you will probably have the entire beach to yourself to make the most of your time there. If you are looking to make the most of the waters then kiteboarding is definitely something you would definitely want to try. Imagine skiing, snowboarding, paragliding, surfing and sailing all packed into one thrilling package and boom! You have kiteboarding. The best and safest place to try out your sea legs would be with Carib Kite-Boarding at The Bitter Yacht Club. The Professional Air Sports Association (PASA) certified trainers will make this fun and thrilling endeavour really very safe.